In my previous article, Budgeting: When You Track It, You Get Better at It, I hope I got your attention with the poorly run business that couldn’t be acquired because it didn’t know what its monthly expenditures were. I’d like to take you back to that example for one additional lesson. Let’s say that business relies on having a working copier as a core piece of its business. And right before a big presentation that would save the company, the copier dies. You would hope that company would have the cash on hand to buy the copier otherwise they’ll buy it 2 and a ½ times over the next 3 years. However, without a reserve or emergency copier replacement fund, they’re out of luck and have to spend $25,000 for a $10,000 product. I bet you see this coming…we live in the exact same way! We inherently know we should have some money set aside for emergencies, but we don’t do it. We end up spending money we can’t afford to spend on emergency situations that we should have prepared for. You’ll notice in my articles we haven’t immediately hammered you with paying down debt at the very beginning. You know you need to pay down debt, but no amount of reading is going to allow you to pay it all off in one week. Big debt is a big problem with a lengthy fix. If I tried to fix it without freeing up some cash (by cutting expenses) and give you some cushion for emergencies, you would get discouraged and quit. Finding cheaper insurance – frees up additional money each month to pay off debt/save/invest. Refinancing – frees up additional money each month to pay off debt/save/invest and saves you thousands of dollars in interest. Cutting recurring expenses – frees up additional money each month to pay off debt/save/invest. Tracking your spending – so you can decide if your spending needs to be cut back. The more money you free up each month, the more you will be able to save, invest in your future, or pay off debt (which then frees up even more money). Today, let’s save that extra money for a rainy day. You know you need to have some money set aside for life’s emergencies, but how much is the right amount? Should you have a separate fund for your car, for unemployment, and for medical problems? At the end of the day having some sort of emergency fund, specific or not, is better than having none at all. Here are some tips based on your situation. Remember: the following are guidelines. Don’t take them as gospel; your situation won’t perfectly match up. Do what works for your situation, but take these recommendations into consideration. Singles have it tough because all of their income is dependent upon their work and all of life’s expenses have to be covered by that work. That being said, most singles have lifestyles that cost less than a married couple simply because there are fewer people to provide for. A general rule is to have a minimum of 3 to 6 months of your monthly expenses saved up for emergencies. This helps you in several ways: if you lose your job, you could keep your lifestyle and spending the same for 3 to 6 months while job hunting. In reality you would probably drastically cut back to extend how far that money could carry you. And for most people, having 3-6 months of their total monthly expenses saved up will help cover most major costs like an air conditioner going out or a vehicle needing significant repair work. Being married is more complicated, especially on the financial front. Sometimes both spouses work, sometimes only one works, so the guidelines have to be a bit different. Since there are two people involved (and of course, often children as well), you need to have more money saved up in case something goes seriously wrong. A minimum of 6 to 12 months of expenses is your goal. Your primary risk is losing a working spouse’s income through unemployment, disability, or death. Having funds set aside to cover yourself in those situations is critically important. Even if both spouses work, one job loss can put your monthly expenses above your income not to mention what happens if both spouses are out of work. The easy answer is: wherever you won’t be tempted to grab it and go to Vegas. You can save it at your local bank where it won’t earn hardly any interest, or better yet in an online savings account. The point of the savings isn’t to earn interest…that’s just an extra perk. The point is to have cash on hand when times get tough and unexpected costs arise. 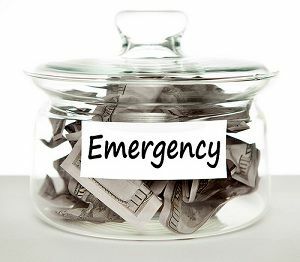 For a more in depth discussion, read: Where to Keep Your Emergency Fund. Take all of the money you trimmed from your monthly expenses and set up an automatic savings plan. Your bank can automatically withdraw it from one account and put it in another. If you saved $10 per month on your insurance and cut $40 from your monthly expenses, you now have $50 each month that you can set aside for the future. That’s $600 per year. It might take you a while to reach your target goal, but having any kind of money saved up in the mean time is a good thing. Also, consider selling a bunch of things to build up a quick cash reserve. Your emergency fund is the foundation that your finances are built on. It helps stabilize your financial situation and gives you an easy “out” when you run into a money crisis. Of course you will only truly see the value of an emergency fund the first time you use it. Realizing you didn’t have to take on additional debt and paid cash for whatever problem popped up is an amazing feeling. Set a goal based on your personal situation. Automatically set aside money into an account you won’t touch unless it is a true emergency. Consider selling stuff you own to quickly ramp up your emergency savings. Do you agree? I’d love to hear from you. Leave a comment with your thoughts. Good article. I think my wife and I fall into the category of spending money on emergencies that we did not prepare for. We do have an emergency fund but at times I may take advantage of those funds to pay down or off some debt, therefore putting the fund back to $0. I would totally agree with the automatic savings plan. Once it’s setup you don’t have to worry about it. Kudos on the article. Typically I find blog posts that discuss the importance of an emergency fund but this one actually teaches you how to save money, how much to save and where to store it. What a great article of advice. I like how you broke it down into singles and married folks, planning is definitely different for these two groups of people. Thanks again! Those who fail to prepare, prepare to fail. The emergency fund is so necessary, when there are surprise drains from every direction. Sound financial planning will include an emergency fund. You give us some great information about where to save; so we are ready for that rainy day! Some great info here. My only comment is that if two people work in your household it is unlikely you’d have to replace both incomes with an emergency fund. I do agree that if you have dependents you should have more saved though. Great advice. In fact, our advice is that even college students, or recent college graduates, make saving for an emergency fund a priority – even as they are paying back student loans.